Amy Schumer . Michelle Williams. Tom Hopper. Adrian Martinez. Emily Ratajkowski . Rory Scovel. Women on Film. Feel Good. Comedy. 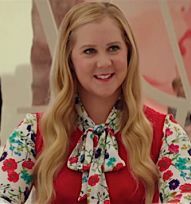 In I FEEL PRETTY a woman who struggles with feelings of deep insecurity and low self-esteem, that hold her back everyday, wakes from a brutal fall in an exercise class believing she is suddenly a supermodel. With this newfound confidence she is empowered to live her life fearlessly and flawlessly, but what will happen when she realizes her appearance never changed?